There were four book titles that came free with Nido 3+. In order to complete the collection, we bought four boxes of Nido 3+ just to make sure that we got everything. She will be able to finish up the milk in no time anyway. 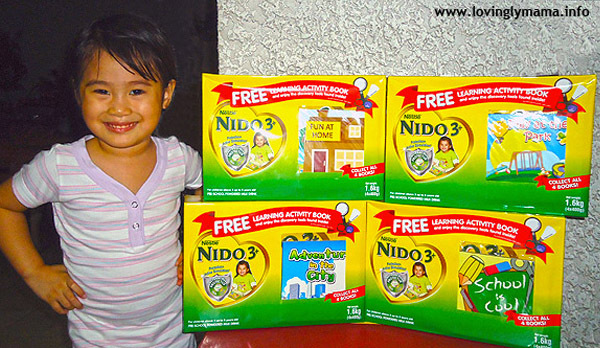 Nido 3+ is giving away free books for kids with each milk box. But I was so sad that I was not able to get any one of the free books for kids last time because somehow, they were not available in our local supermarket. Or maybe they were just sold out. I was told that these free books for kids are actually story books and I know that Dindin would love them. She loves to read and we are running out of books in the house! But I don’t know why we never found them when we go to the supermarket, since I actually go to the nearest supermarket twice a month. Maybe they sold out fast because they are so nice! But yesterday, I was happy to find out that they have put up a new set of four (4) activity books. These free books for kids come with the 1.8 kg box. I saw that there were only four boxes left on display so I had the merchandiser reserved it for me so that I can come back and get them later today. I don’t want to miss this offer again. And so we did! Dindin is so happy with the activities in the Nido 3+ free books for kids! She is also very happy that she is able to read the entire book all by herself now! She has learned to read complete sentences before she turned three and now she has read so many books already. And then we did some of the activities together. Eventually, I left her to work on the others but up until now while I am writing this, Dindin is still doing the activities. They are very engaging! So I am glad that we got all of them. These are so much better than toys, plus they are absolutely free! The four free books for kids that we got from Nido 3+. One book came with each 1,8kg milk box. Reading is very important in our home. We intend to expand Din’s horizon through the books that she reads. It’s part of our preparing her for homeschooling in Bacolod. Never mind that we had to spend for the four boxes of milk all at once. She will drink them up anyway after some time, so there is no wastage here. hehe This is almost two months’ supply of milk for her. Thank God for credit cards for moments like these when there are good buys and you are cashless. 😀 With that, my daughter got all four free books for kids from Nido 3+. It’s nice to see Nestle continue making educational books as promotional items. I’m stopping by from the Irish and Italian Blessings giveaway. She is so adorable! and that’s so impressive that she can read them by herself! These look like they would be great for my Preschool class children. I will pass on this info to parents ~ they may want to put them on Santa’s list! Thanks! 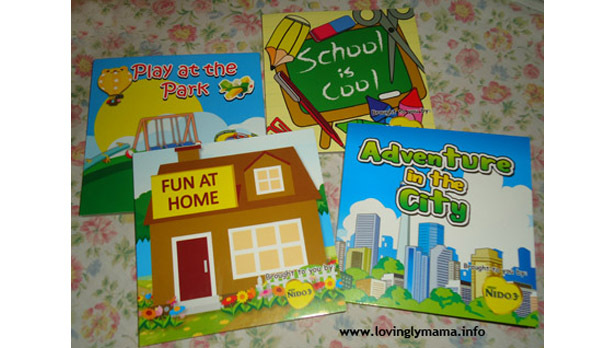 hello, i am also collecting these activity books, i need the ADVENTURE IN THE CITY to complete my collection, but unfortunately i couldn’t find it anymore 🙁 if you mommies have extra of this book please let me know i’m willing to buy it just for my daughter, because she really love these books thanks. At last! i found the last book to complete my set, thanks god! Oh that’s great! haha My reply is late. That is good, because actually, I haven’t seen them around Robinsons anymore either.